Support your Galleries and become a Friends of the Galleries member today. Membership gives you an insider’s view of Perc Tucker Regional Gallery and Pinnacles Gallery, taking you into the world of art in ways that go beyond visiting and viewing. Friends of the Galleries are also part of a social network of people who support the visual arts and enjoy unique Member benefits. There are a range of Membership categories to suit every need, while Memberships may also be purchased through the Gallery as a gift for a family member or friend. Friends play an important role in the life and work of Townsville’s key public Galleries through the contribution to the acquisition of works of art, the mounting of visiting exhibitions, continual learning and the publication of new scholarship. Upon signing up, all Friends of the Galleries will receive a membership card to access many of the program’s benefits, and a pack of Gallery materials and publications to make them feel welcome and provide information about upcoming exhibitions and events. Friends of the Galleries will be given preferential booking to the Galleries’ annual program of workshops, lectures and social events. We will treat Friends of the Galleries to exclusive members only events at Perc Tucker Regional Gallery and Pinnacles Gallery, including talks, lectures and workshops. We will also arrange social outings to other arts and cultural institutions for Friends to mingle. Perc Tucker Regional Gallery and Pinnacles Gallery order and develop a host of beautifully designed literary works to accompany major exhibitions. Upon request, Friends of the Galleries will be provided complimentary copies of select Gallery publications. By and large, access to exhibitions at Perc Tucker Regional Gallery and Pinnacles Gallery is, and will remain, free. Where an exhibition admission fee is required to be charged, Friends of the Galleries will enjoy discounted rates. Friends of the Galleries will be able to keep up-to-date with all the happenings at Perc Tucker Regional Gallery and Pinnacles Gallery through subscription to an exclusive quarterly email newsletter, and also receive periodic exhibition and event updates, and special offers from participating local businesses. Friends of the Galleries will receive a 10% discount on all items in the Perc Tucker Regional Gallery and Pinnacles Gallery shops upon presenting a valid membership card. Items for sale in the shop include small wares by local artists, publications, cards, lomography cameras and equipment, and great gift ideas. Friends of the Galleries will reap the rewards of their membership all around the country by receiving reciprocal member benefits with other participating regional, state and national cultural institutions upon presenting a valid membership card. 10% off any meal purchase. Vmax an additional $3. Excludes 3D. 10% off full priced items, excluding food. 10% off purchase, excluding cigarettes. Discounts on workshops and 10% off purchases. 10% off general entry. Not valid with any other offer. 5% discount on Sylvia’s original paintings excluding specials. 10% off in the Vault Shop at Perc Tucker Regional Gallery. 5% off all full-priced items. 15% off all full-priced items. 15% off storewide excluding sale items. 10% off custom framing and materials. Concession membership is offered to holders of Government-issued cards for pensioners and full-time students only. Seniors Business Discount Cards do not qualify for a concession. A full-time student ID card must be shown. Membership benefits and discounts are only available upon the presentation of a valid Friends of the Galleries membership card. Friends of the Galleries membership cards and their benefits are non-transferable. Friends of the Galleries membership is non-refundable. Reproduction of a Friends of the Galleries membership card in any form is strictly prohibited. A fee of $5 per member per card is payable for all requested replacement cards. 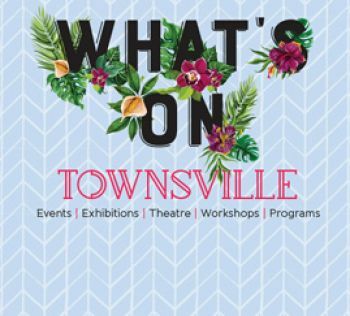 Townsville City Council may terminate a Friends of the Galleries membership at its absolute discretion if a member fails to comply with these terms and conditions or misuses membership privileges. A Friends of the Galleries membership will be considered ‘lapsed’ if not renewed by the due date. The expiry date of an annual Friends of the Galleries membership cannot be suspended or extended past the expiry date stipulated on the membership card. Townsville City Council reserves the right to change these terms and conditions or Friends of the Galleries membership benefits where necessary at any time without prior notice.